From Huawei to Xioami: What Do App Developers Need to Know about China’s Smartphone Market? From Huawei to Xiaomi: What Do App Developers Need to Know about China’s Smartphone Market? Home to hundreds of millions of users and generating tens of billions of dollars of revenue each year, China has been one of the most important mobile app and mobile gaming market for global developers without doubt. See what developers need to know about the Chinese handset market. China’s importance in the mobile app and mobile gaming has long been known about. Home to hundreds of millions of users and generating tens of billions of dollars of revenue each year, it is crucial that developers get their apps onto the smartphones of users across the country. But which device will those users be opening an app on? And how will that affect their experience? For businesses with little knowledge of the Chinese market, that can be tough to answer – especially with the recent proliferation of domestic device manufacturers in the past few years. So what does a developer need to know about the Chinese handset market? And how could it affect the way a developer creates an app or game for China’s enormous user base? Let’s take a look. It’s hard to emphasise just how big the Chinese smartphone market is. According to Newzoo, there are over 775m smartphone users in China. This makes its home market larger than its three nearest competitors – India, the US and Brazil – combined. However, its growth is slowing. Even though smartphone penetration sits at 55.6%, Canalys reported a decline in smartphone shipments in China from 2016 to 2017. The reason for the downward trend is not due to a decline in the size of the market. Instead, upgrade cycles in China have elongated because entry-level smartphone users in rural and developing areas of the country are still happy with their basic devices. This means that developers can count on the Chinese market to grow in the future. But it also means that companies should keep an eye on engaging the long tail of users on older devices too. Fragmentation is one of the buzzwords most associated with the Chinese mobile market. Yet when it comes to handset market share, the story is changing to one of out right home rule. 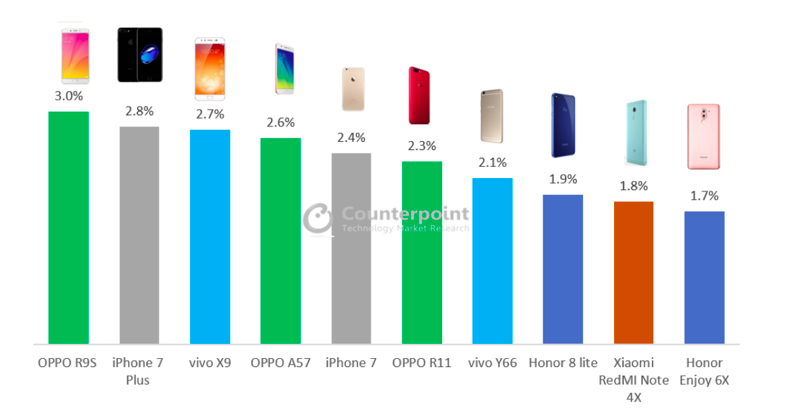 According to Counterpoint Research, 77% of Chinese smartphone market share went to just five brands. And out of those five companies, only one – Apple – was founded outside of the country itself. Huawei, Oppo, Vivo and Xioami took up 66% of the country’s smartphone market share in 2017. This is up 10% on their 56% market share in 2016, reducing “Other” brands market share in China from 33% to 23%. For developers, this is mostly good news for a number of reasons. First, it makes it easier to develop apps for the market by allowing companies to focus on a smaller pool of devices, form factors and tech specs. Second, it also helps developers go someway to answering the age old Chinese app store distribution platform. With Huawei, Oppo, Vivo and Xioami all boasting their own Android stores, developers optimising for their devices also have a number of obvious distribution routes to take. The Chinese mobile market may have a long tail of users on rudimentary smart devices. But the users at the top of the market do not compromise on the quality of their handsets. While Chinese devices are often – rightly – identified as cheap in comparison to Western competitors, the three most popular home made phones in the Chinese market each boast serious clout. The Oppo A57, for example, sports and octacore processor and 3GB of RAM. As a point of comparison, that is the same amount of RAM that comes with both the iPhone 7 Plus and the iPhone 7. In short, developers releasing apps into the Chinese market can be reassured that users at the top of the market do have highly capable devices. This means that processor intensive apps or games can gain traction amongst users – allowing for richer experiences to thrive in the country. 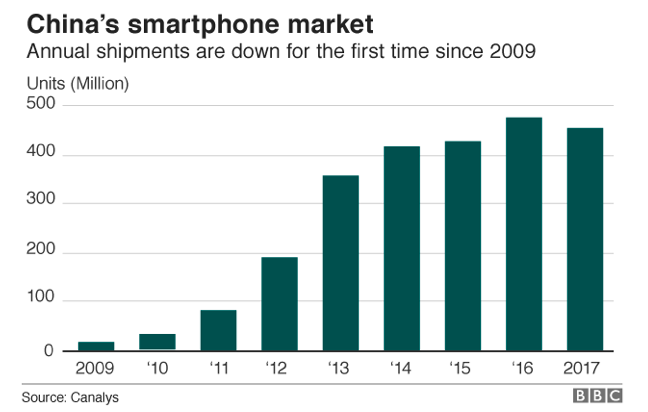 Finally, app developers need to pay attention to the Chinese handset market because the companies succeeding there are now bringing their devices to the world. 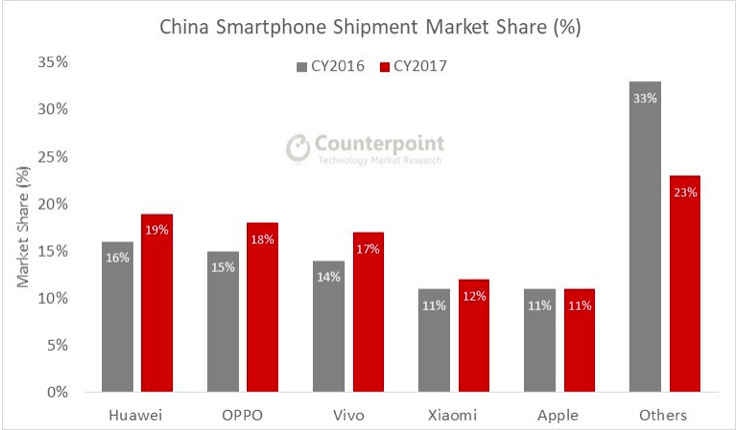 Despite the slowdown in the Chinese domestic market, Vivo, Oppo and Huawei still emerged from 2017 as some of the fastest growing smartphone brands across the globe. This is because they have successfully broken out into territories abroad to further increase their global market share. 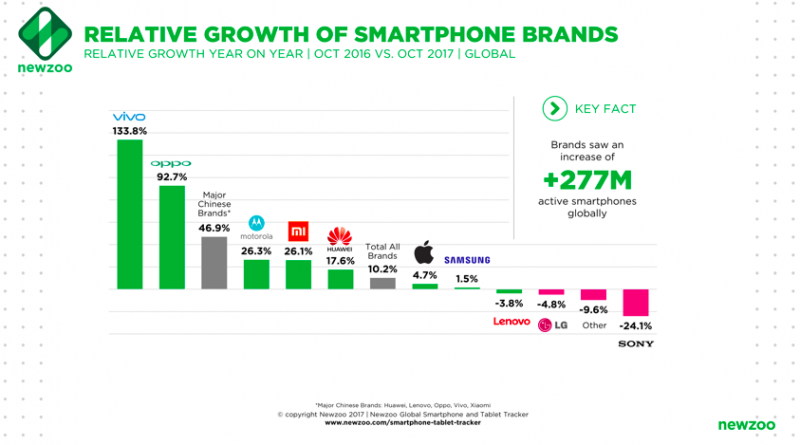 For example, Counterpoint Research indicates that Huawei quietly took 13% of the UK’s smartphone market share in Q3 2017. This made it the third biggest brand in the country, just behind Apple and Samsung. Meanwhile, Xiaomi has consolidated its hold in the Indian market. It took 30.3% of the country’s smartphone market share in Q1 2018, according to the International Data Corporation’s tracker. That’s up nearly 4% from the previous quarter and puts Xioami five points ahead of Samsung, which sat on 25.1% share. Even South East Asia can’t resist the rise of the Chinese giants. Earlier this year, the Nikkei Asian Review reported that the combined sales of Vivo, Oppo and Huawei beat Samsung’s in the region for the first time – threatening its hold there. So even if you’re not considering going into China, app developers have to take Chinese device types seriously. 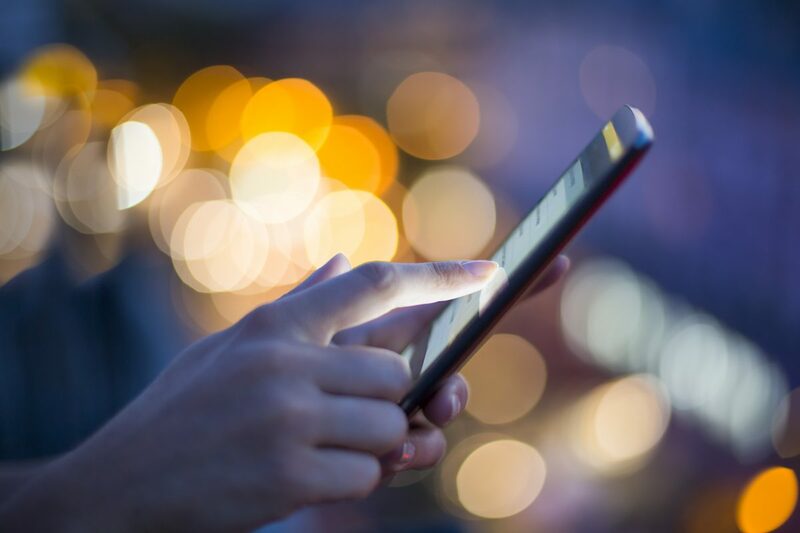 As the cash rich brands expand outside their home market, the form factors, specs and distribution platforms associated with each handset will become increasingly important – changing development and release strategies along the way.